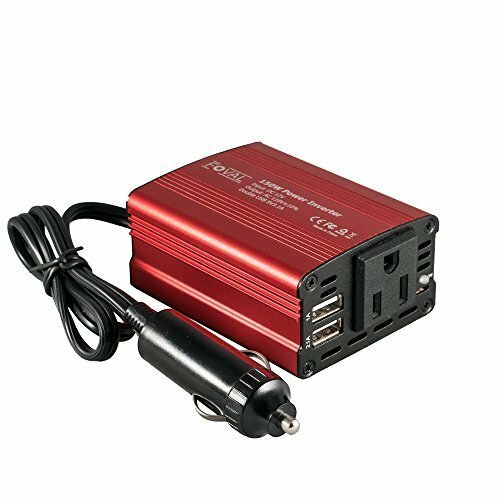 Bestek 75W power inverter is the best tiny size inverter for your car designed as a portable power inverter with only 5.5 inches in length and 2.4 inches in width. You can easily put it in your pocket and take it anywhere with you. It is also one of the most popular inverters for a car in US market. Bestek 75W has a fantastic design and a perfect fit for most cars. Because this inverter is limited in the amount of power supplied through the cigarette lighter (only 75W), so it is ideal for charging your mobile phones, your tablets, and some other mini AC devices. Don’t use it to charge your laptops because it could cause some risks of overheating and then damage your devices. If you want to charge your laptops on your car, get a bigger one. It has 1 outlets and 2 USB ports (one with 1A and one with 2.1A), you will be able to charge up 3 devices simultaneously. But when you are charging your iPad with the 2.1A USB port, don’t use the 1A USB port simultaneously, keep it free. 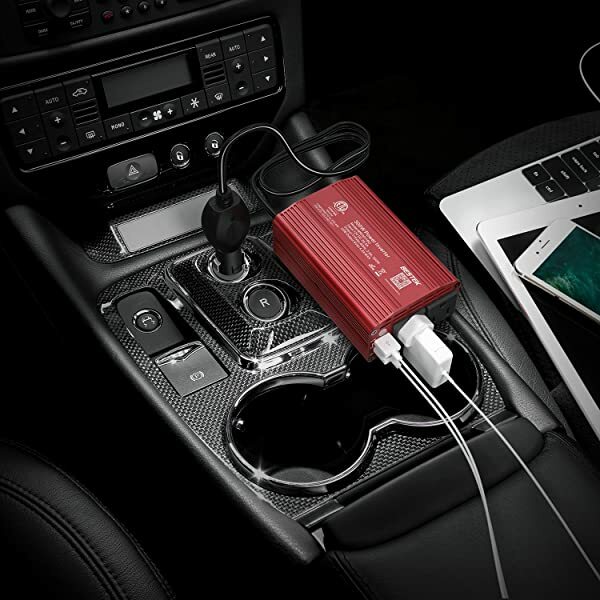 The Bestek 75W power inverter converts 12V DC to 120V AC power with very high performance that is ideal for charging phones and tablets on your car when you are driving. It is only suitable for car and not applied for 24V DC and airplane use. This portable inverter is totally safe to use, even for children. It has a full protection and auto-shutdown keeps your appliance and car from overheating, overloading, low load, short circuit, low voltage, and overvoltage. When using it, the inverter may become fairly warm to the touch, however, it doesn’t damage the device in any way. But, be careful to place the inverter next to heat-sensitive materials and in direct sunlight. The approximate temperature is 95 degrees Fahrenheit. The power inverter will automatically shut down if the internal temperature exceeds the safe design parameter. Bestek 75W provides 75 watts continuous DC to AC power and 200 watts of peak power. It can be connected to your car through a 12V cigarette lighter and easy to adjust with its pivoting head. It uses a modified sine wave for its power output. Because of a modified sine wave, it has a small size and off steps that could cause interference in the powering of your devices. If you read my buying guide, you would know that the pure sine wave inverters are better than the modified sine wave inverters. But the modified sine wave inverters are significantly cheaper than the pure sine wave inverters, and they are recommended for car (under 300W). Please note that when you are charging your devices by a modified sine wave inverter, the charger will heat up quickly, be sure to care about that. One more thing: Do not use it to power high power electric devices such as hair dryers, electric heaters, which might blow a fuse. This inverter is the best portable power inverter ever, it is pretty small and great for travel. It has green and red indicator lights, so you can look at them to make sure your devices were being charged. Bestek offers a variety of customer service options. The cooling fan could make some noise. 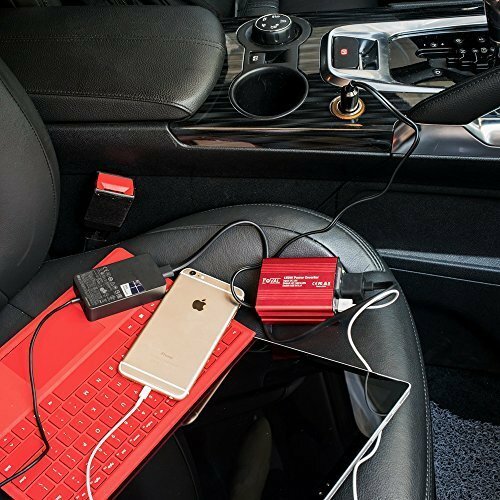 Bestek 75W power inverter is the perfect device for people on the go. It is cheap and ideal for charging up your phones and your tablets. It comes with a great warranty and is extremely simple to use. The Foval 150W power inverter is the smallest 150w inverter ever seen. Its size is only 3.2 x 2.5 x 1.5 inches, just about credit card size. It is extremely portable and is a perfect device for travelers. The red color and aluminum shell design are fantastic and solid. This seems to be very sturdily built. The Foval power inverter plugs directly into the lighter and is only a few inches long. It can supply up to 150 watts that are great for charging a laptop, breast pump, nebulizer, game console, Kindle, TV, DVD players, lights, iPad, and other electronic devices. It comes with 2 USB ports and AC outlets, unlike Bestek 75W inverter above, 2 USB ports can charge tablet and phone simultaneously. With it, you would be able to use all your portable devices from your car. The best feature of this inverter is cooling fan. Smart cooling fan makes the car power inverter silent when operating helps reduce heat and prevents shortage. It is great because you won’t have to monitor the heat levels of your charging devices. This inverter is also one of the most popular inverters sold on Amazon.com. Actually, it’s hard to find out any other 150W power inverter that can beat this one. The Foval 150W power inverter is extremely simple to use. Connect the cable to the cigarette lighter in your vehicle. It comes with 16 inches length cable with cigarette lighter plug since we can reach it to power a laptop in the rear seats. With 150 watts rated power, 12V/40A DC input so you can with all your favorite electronics. The Foval inverter has a variety of built-in safety features such as built-in fuse to protect your device, safe charging provides protection against, overheating, under and over voltage charging, short-circuiting, overloads, and overcharging. It also has a feature that will protect your car battery. If you are using the inverter while the car is turned off, the unit will alert you when the car battery is close to dying. It will shut off if the voltage below 10.8V to protect your batteries. This can help you, in a worst-case scenario, to avoid draining your battery. If you are using the inverter while the car is turned off, it is recommended that you start the car every hour and let the engine run for about 10 minutes. It is modified sine wave inverter, but it is still a perfect 75W inverter for your car. It works silently, the cooling fan is pretty quiet. We like everything about this inverter. Foval 150W power inverter is the best portable inverter for driving, camping, outdoors, vacations and even charging small household items. You can’t go wrong with this power inverter, especially if you are always driving. When I knew it comes from a Chinese provider. The first thing I thought about was quality. But when I used it, I did know that it is a very good inverter. It also has many positive reviews from buyers on Amazon.com, almost 100% customer satisfaction. The Bestek 200W power inverter has a nice compact design with a nice shiny white. When I first looked at this item, I didn’t understand why they put so many sockets and USB ports on a 200W inverter. It has total 7 places to plug devices, 3 AC outlets, and 4 USB ports. It is convenient for anyone who has many devices to use. It can power 7 devices simultaneously, great for charging smartphones, laptop, tablets, GPS or anything you want. But don’t use power higher than 200W, it may cause some serious issues. Bestek 200W is a portable designed power inverter with high performance. Because its size is pretty small and lightweight (9.6 ounces), it is recommended for those who travel very often. 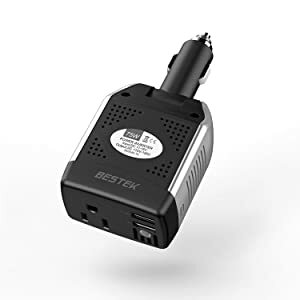 The Bestek 200W power inverter is connected through the cigarette lighter and provides an AC outlet that can be used to power most small-wattage electronics. It is very simple to use. It comes with 2.5-foot length cable with cigarette lighter plug since we can reach it to power a laptop in the rear seats. It provides 200W continuous DC to AC power and 500 watts peak output power to charge your multiple electronic devices on the go. It has 4.2A of USB charging ports since you can charge up 2 iPads or 4 iPhones simultaneously. But if charging your laptop from empty when you are using, it will require around 200W, please keep the other outlets and every USB port free. I recommend this unit for charging small electronics since larger devices may cause it to overheat. The Bestek 200W converts 12V DC to 110V AC power and recommended for car only. It is not applied to 24V DC and airplane use. The inverter has a variety of built-in safety features. If power consumption surges, the unit will shut down. This feature protects the inverter from an overload. Also, if the power inverter gets too hot, which it likely will due to its lack of a fan, the unit will automatically shut down. Another option of this car inverter offers is the low battery alarm and low battery shutdown. If the input voltage from the car battery drops below 10.5 volts, an alarm will sound. If the voltage drops below 10 volts the inverter will automatically shut down. This will protect the battery from completely draining. If this does happen, simply turn the power switch to the off position, fix the voltage problem and restart the power inverter. It outputs 60 Hz and it is modified sine wave inverter, which is perfectly fine for most modern devices, but isn’t good for fluorescent lights, and many analog audio systems. 3 outlets and 4 USB ports, enough to charge all your phones, your tablets, GPS units simultaneously. You can use all USB ports without turning the switch on. The cooling fan makes some noise when operating. If you don’t care about its little noise, I think Bestek 200W power inverter is must have item for traveling. It is functional and pretty small, a good portable inverter with 7 charging ports, enough for all your favorite devices. Are you planning to buy an inverter for your car? Are you afraid that the power inverters listed above would not provide enough AC power for your devices? Don’t worry, Bestek 300W power inverter is the thing you need. It is the most popular car inverter in the US, the highest review number of any power inverter brand. 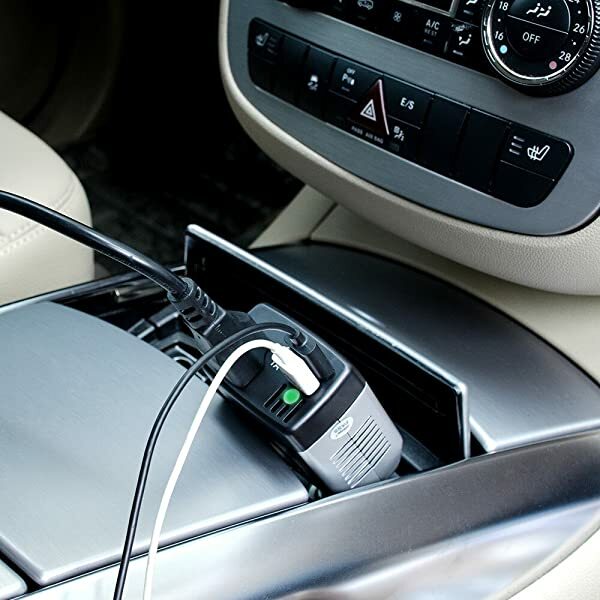 This useful device plugs into your vehicle’s standard DC power port by “cigarette lighter” and converts its output to two standard AC outlets, as well as two USB charging ports. It has a nice compact design with a solid red shell. And its size is very small, lightweight, just equal size of iPhone 5 since it is ideal for use on your car, vacations, work trips and camping. 24-inch cigarette lighter plug makes the power inverter can be plugged into almost any vehicle, allow you to plug the unit into the front seat cigarette lighter and easily place the unit in the back seat area. 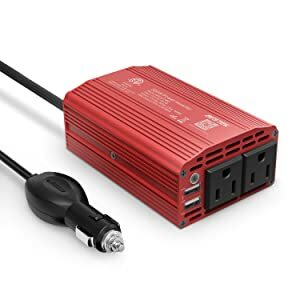 The Bestek 300W power inverter provides 300 Watts continuous DC to AC power and 700 Watts peak power, featuring 2 AC outlets and 2 USB ports (2.1A & 1A) for multi-purpose charging. You can use the 1A USB port to connect cell phones, and 2.1A USB port to connect tablet. With this inverter, you can plug devices into 2 USB ports simultaneously. The inverter has multiple integrated safety features. One of those features is an overload protector. When there is a power surge or the device draws too much power, it will shut down before the portable inverter is harmed. The inverter also has a feature to protect against overheating. If the internal temperature of the car power inverter exceeds 104 degrees Fahrenheit, the inverter will automatically shut down. It will be warmer after approximately 30’ of use, avoid placing the inverter next to heat-sensitive materials to protect inverter from getting too warm. When the inverter is powered on, you will be able to hear the fan noise, a fan runs to keep the unit cool. But don’t worry about that, it’s not too loud. The Bestek is a modified sine wave inverter. If you read my buying guide, using this type might cause some issues with dedicated devices, but there are some exceptions. If your electronics don’t fall into certain types of electronic device I listed, then you’re good to go with a modified sine wave inverter. Because pure sine wave inverters are much more expensive than modified sine wave inverters, with the Bestek, you can save a bunch of money. You can use 2 USB ports without turning the switch on. 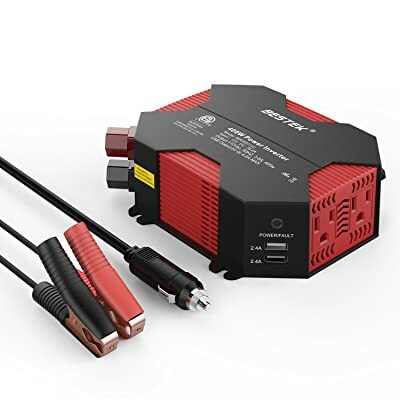 Bestek 300W is the best power inverter for your car. It is easy to use and ideal for camping, traveling. There are not too many alternatives currently on the market within the same budget, price range. I would therefore strongly recommend this to anyone looking for a quick solution to a US output socket whilst on the move. The body of this inverter is made of a hard shell plastic and has a cool octagonal shape and contrasting black and red colors. It is fairly light, weighing 1 lb 2 oz. I like that the fuses are replaceable. Sometimes you don’t remember what the power requirements are of a device before plugging it in and it blows the fuse by accident so at least you can replace them easily without opening the unit up. To be on the safe side stick with small electronics and things without high-powered motors (like a blender). Other users have noted that the fan that runs constantly can be loud, but I didn’t find it noisy or distracting, more like a gentle hum. This inverter is great for road trips, camping, or to have in the car for emergencies when you have access to a charged battery. 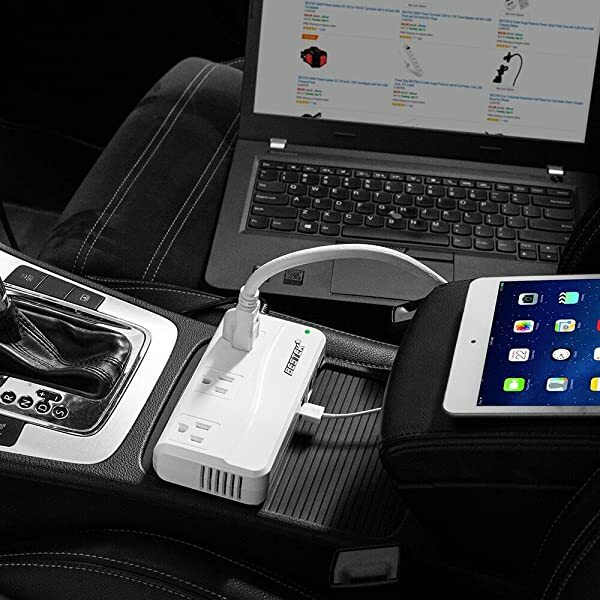 When using this in the car, you’ll have overheating, overload and short-circuit protection in both directions for both your devices and your car. It’s compact, lightweight, and has a decent wattage capacity and has plenty of powering options. When I asked my friend about the best 1000 watts pure sine wave power inverters, he referred the Bestek brand to me. He said that it is the most popular 1000 watt inverter in the US, it has been used by thousands of people. But I was looking for a pure sine wave inverter, so the Bestek was not the way to go. After an hour of searching, MicroSolar 1000W was the answer for my question. It is the best 1000 watts pure sine wave inverter on the market. This inverter provides 1000 watts continuous DC to AC power and 2000 watts peak output. A “Pure Sine Wave Inverter” produces a real waveform and also switches at 60HZ. It gives the same purity of, power as your electric company does. Modified sine is 1970’s tech and good for things from that era, pure sine wave is “modern” tech and it is good for every AC devices. Most electric devices will run cleaner and cooler on pure sine wave. MicroSolar 1000W is the Inverter/Charger, it helps you charge up your deep circle battery (not a regular car battery). It is perfect power inverter for your RV, your wind or solar generator. It can run all your electronic devices such as TVs, computers, phones, digital clock…Because it is pure sine wave, it definitely runs well with every dedicated electronic device, medical equipment. 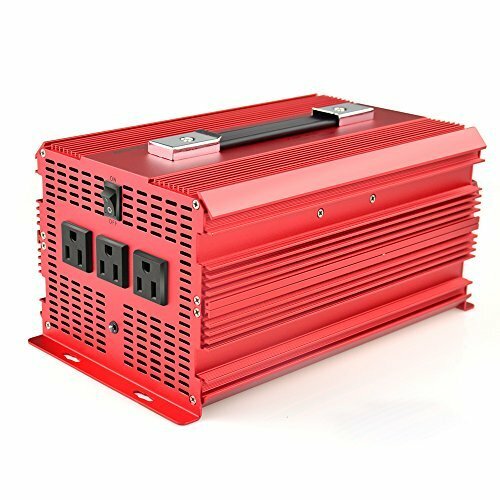 If you are looking for a 1000 watts power inverter to install in your RVs or use with some solar panels, you should get this one. This is a great piece of kit for a decent price. It provides total 2000W continuous DC to AC power and 4600W peak power, the capacity to handle motors from household AC units and 1hp pool pumps or run a garage (floodlights, a TV, a freezer, a refrigerator, rechargeable devices, etc) even your microwave ovens. If the microwave oven is 1100W (most microwaves are 800W minimum), it requires peak power which is 4 times of 1100W = 4400W peak surge (less than 4600W). Well for just over $100 this is a good deal. The max output of the device is 2000W at 115V, or 2000W/115V = 17.39A. Therefore, any device pulling less than 17.39A at 120V will run on this inverter, so long as the peak, Watts also stay < 4600W during motor startup. There are many good quality 2000W power inverters out there, but if I were you, I would definitely choose the Bestek 2000W. Once installed in your RV or your car, you would be impressed. Highly recommend especially at this price. Let’s ramp up the power today by looking at 3000w pure sine wave inverter – VertaMax 3000W. This is the best 3000W pure sine wave inverter for your solar power system. 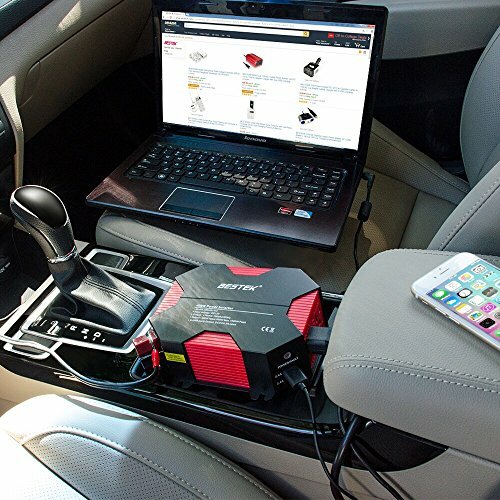 The VertaMax efficiently converts DC power from your vehicle, boat, or directly from a dedicated 12V DC battery, into 115V AC power that is commonly used in a wide variety of household AC items, such as computers, mobile phone chargers, radio, TV etc. If you have already installed some 100W solar panels on the rooftop of your house of your RV, then you buy this 3000W pure sine wave inverter with an MPPT charge controller, you would have a perfect solar power system that can handle every household devices. This inverter converts 12V DC to 115V AC power for USA household devices. It provides 3000W continuous power and 6000W peak surge power, ideal for computers, televisions, video game consoles, microwave, air conditioners… Pure Sine Wave Inverters are recommended for sensitive electronic equipment that requires pure sine wave AC electricity to operate properly. It was designed as an off-grid solar inverter since it is inverter/charger. It can be used for charging your deep circle batteries. It has been running very well and reliable and has many battery protection features. This inverter doesn’t make any noise. The only noise this will make is when the temperature is high and the fan will operate. You can run many devices such as microwave oven, coffee maker, TV, laptop simultaneously. There are so many of these on the market and if you want to run sensitive electronics or every household devices then you need a pure sine wave power inverter like VertaMax 3000W. 1.What is a power inverter? Power inverter is one of the most significant inventions in human history. It is an electronic device that that converts DC (Direct Current) to AC (Alternating Current). DC is a flow of electrical charge carriers that always takes place in the same direction, whereas AC is an electric current which periodically reverses direction. DC is a low-voltage power (12V or 24V) that generated from sources include car, truck, boat or stand-alone batteries and alternative energy such as solar panels or wind turbines. AC is standard household power allows you to use electrical devices such as TVs, laptop, coffee maker, refrigerators or electrical equipment in cars, RVs, trucks, boats or some small devices when camping. The standard voltage and frequency of AC electricity used in homes vary from country to country throughout the world. Typically, either 120-volt AC or 240-volt AC is used. Also, most countries use 220V~ 50Hz (AC reverses its direction 50 times every second) as the AC frequency. But the standard in the United States is 120V and 60Hz AC electricity. When buying a power inverter for using your household electrical appliances, you need to check the power inverter specifications first. If you live in the US, you must choose the power inverters that have 110V outlets (output voltage: 110V~120V) and if you live in Europe and Asia, your power inverters must be included 240V outlets (output voltage: 220V~240V). When visiting another country, you need to bring an inverter that says some things like “100V-240V, 50/60 Hz”, it will work anywhere in the world with the right plugs. If not, this device will help to convert the AC voltage from 220V to the 110V. With power inverters for the car (typically under 300W), they can be connected to a vehicle’s battery through the cigarette lighter plug on the dashboard. They might also come with jumper-like cables for connecting directly to a battery. Larger units are often hardwired into vehicles, RVs or boats. 2.Why you need Power Inverter? Let’s pretend for a moment that you are on your car that you love so much. While you are enjoying yourself, you realize that you forgot to finish some work on your laptop. However, your laptop is out of battery, it requires connecting AC power and all your car has is DC power. This is the perfect time for a power inverter to save the day. When the power goes out, an inverter will give you power. Let’s go back to the laptop that you have to get some work done on. If you are at the docks and you have a shoreline to give you power, you’re saving your batteries, in fact, you’re charging them up. But if for some reason the shore power goes out, the power inverter will kick in and keep your computer going. Your computer, TV, or all other home appliances won’t die suddenly and you won’t lose the paper you’ve been working on should you are using your computer system. You have an RV for camping or traveling everywhere, your RV was built with all household appliances such as a coffee maker, laptop, a microwave, TV, refrigerator …and 1.5kW solar panel kit on RV’s rooftop. The solar panels will provide power to the batteries, then the power inverters will convert DC battery power into AC power to run devices. You already have everything you need, just enjoy and think about the place where you want to go. Power Inverter doesn’t just serve as an inverter that converts the current from DC into AC, it works as a charger as well. There are many devices that are made for charging batteries with strict functions, but with a power inverter, you get two electrical devices in one. But not all power inverters are Inverter/charger. Power inverter is noiseless. You do not have to care the noise from generators. Running cost is Zero: They require no consumables like diesel, petrol or oil, saving you lots of money on spent on power generators. Also, no frequent breakdowns as you’re likely to get with your overworked power generator. The inverter also produces no fumes or smoke, saving your environment all the air pollution your power generator emits. Auto-run: It starts up itself, as soon as the power goes off. All the stress of starting, stopping, changing over, topping oil, pouring diesel, cleaning oil mess and all the other tedious chores of managing a generator are eliminated for you. inverters run in automated mode, requiring no manual intervention. 3.What type of power Inverter do you need? There are 3 major types of inverters: Pure Sine Wave, Modified Sine Wave, and Square Wave. Today, Square Wave inverters are seldom seen anymore, because it is old and inefficiency technology. Inverters come in 2 distinct flavors are pure sine wave and modified sine wave. Modified Sine Wave inverters will work fine with most equipment, although the efficiency or power will be reduced with some. They can and do cause problems with delicate electronics (or anything with an electronic or microprocessor controller) and some risk of overheating and noise might happen. However, on the positive side, modified sine wave power inverters tend to be more affordable and often work more efficiently (which is important if you want to run something off a battery with a limited charge—because it will run for longer). They are also more popular than pure sine wave power inverters. You are going to use the inverters for simple systems that don’t have any delicate electronics or audio equipment. You just want a cheap and highly efficient inverter. 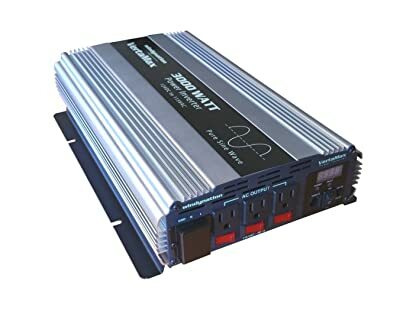 You just want a small size power inverter to charge your phones or your tablets in your car, you should get a modified sine wave inverter for a lower price. You also can use modified sine wave inverters for hair dryer, washer, furnace blower, fan, electric drill, vacuum cleaner, electric saw, blender, electric razor. Pure Sine Wave is what we get from our local utility company and from a generator. The major advantage of a pure sine wave inverter is that all of the equipment which is sold on the market is designed for a pure sine wave. This guarantees that the equipment will work to its full specifications. Some appliances, such as motors and microwave ovens will only produce full output with sine wave power. A few appliances, such as bread makers, light dimmers, and some battery chargers require a pure sine wave to work at all. If you aren’t sure if the device you want to use requires a true sine wave or not, call the manufacturer to ask. Any AC device will run on a pure sine wave inverter, whether it requires it or not. Pure Sine Wave Inverters are always more expensive than modified sine wave inverters – from 2 to 3 times as much. Equipment and appliances last longer. So, what type of power inverter is right for you? The answer is it depends on you, how you want to use your inverters. If you are planning to run motors or simple systems, I recommend that you buy a modified sine wave inverter for a lower price. But if you want to run well everything, the more likely you will want and need to consider a pure sine wave inverter. 4. Portable Inverter and Inverter/Charger? What should you buy? Power Inverters range from tiny 75W models – good for a mobile phone, light bulb, to 4,000W models that can run heavy-duty applications like microwaves and refrigeration systems. It also comes with 2 types are Portable Inverters and Inverter/Chargers. Portable Inverters are primarily used to provide normal AC power from a vehicle’s battery. Inverter/Chargers are typically used to provide backup AC power in an emergency, such as a power outage. Portable Inverters are usually used in car, RV, boat to convert DC power from car batteries to AC power. They can be connected to your DC electrical system using the common “cigarette lighter socket” or hardwired directly to the battery bank (400W or more). Most “cigarette lighter” power inverters under 300W, plugged on the car dashboard, ideal for laptops, iPhone, small lights, and tools. They are also excellent for family trips in the minivan or SUV. Inverter/charger is a combination of an inverter, battery charger and transfer switch into one complete system. When AC power is available, the inverter/charger recharges the house batteries. It also allows any surplus AC power to pass through and power downstream AC loads, such as a television set or microwave oven. When AC power is disconnected, the unit inverts DC battery power into AC electricity. They have outputs from 2,000 to 4,000 watts. Inverter/chargers should be professionally installed because they draw a lot of amps, with the potential for dangerous shorts and electrical fires if they’re wired inadequately. They become an integral part of your boat, home, off-grid, RV or solar electrical system and can rapidly replenish battery banks in the 400-800Ah range. If you just want a small power inverter under 300W to use in your car for your phones, your laptops, CD players. A portable inverter with the cigarette lighter is a perfect choice. But if you want more, you have to determine you need a portable inverter or an all-in-one inverter/charger system. Installation is relatively easy and virtually anyone can do it. A typical permanent installation should only take about 10 minutes. A temporary install should just take a few seconds. Portable inverters are physically smaller than inverter/chargers, they can be transferred between locations relatively easily. This portability makes the portable inverter a useful device to bring with you camping or to have in case of a power outage. A typical 2000 watts inverter weighs only about 10lbs making it easy for anybody to carry. With a portable inverter and auxiliary battery bank you must carry another device to eventually charge your batteries back up. Inverter/Chargers provides backup AC power in an emergency. If you are afraid of power outage, an inverter/charger is the way to go. They utilize automatic transfer switch. If power is available from another source the inverter/charger will put itself into charge mode. This will allow the three-stage charger to turn on and start charging the batteries. When the transfer switch senses that power has been lost it switches to inverter power. This allows the inverter/charger to start supplying power for all of the loads on the AC distribution panel. Additionally, once voltage in your battery bank drops below the programmed voltage some inverter/chargers have the capability to start your generator. Inverter/chargers either come with or have an optional remote panel that allows you to monitor your usage and battery voltage. Inverter/chargers provide greater efficiency while charging because you are not only charging while the generator is producing power, but you are also supplying your loads, thus resulting in a faster recharge time. If you are in a scenario where there will not be another AC source, i.e. generator or shore power, then there is no advantage to an inverter/charger. Installation of an inverter/charger is a more difficult process than that of a standalone inverter. The average person with no knowledge of AC wiring should not attempt to install an inverter/charger. They are only available in sizes above 1000 watts. Inverter/chargers are more expensive than portable inverters and installation typically costs more. However, you cannot beat the convenience that they offer. 5. What size of power inverter do you need? One of the most important steps in choosing power inverter is selecting inverter’s size. But before selecting power inverter size, you need to determine the voltage of the battery you’ll be using for power. In the majority of cases, you’ll be using a 12-volt battery, so you would want to select a 12-volt inverter. If you are choosing power inverters for your solar PV systems, you may want a 12V/24V inverter. Power inverters come in many sizes, measured in watts. The amount of wattage you will require depends on the total draw of the devices you’d like to use. The wattage rating of your inverter must exceed the total wattage of all the devices you plan to run simultaneously. For instance, if you wanted to run a 650-watt blender and a 650-watt coffee maker at the same time, you’d need an inverter capable of a 1,300-watt output. Unfortunately, things aren’t quite that simple. You have to add at least 50% (might be twice) more to account, so for powering 1,300W of 2 devices above, a minimum 2000W power inverter is recommended. 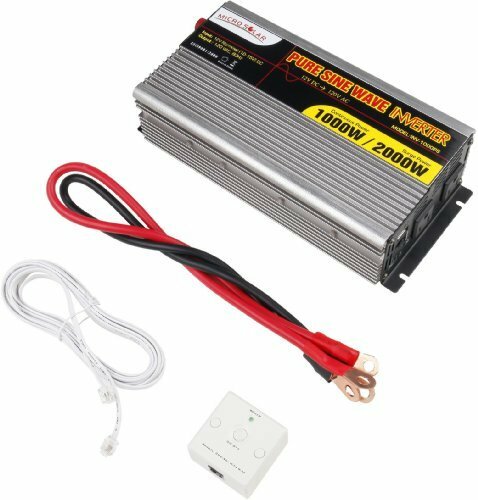 Why we need a 2000W power inverter for 1300W? Because devices that have electric motors, as well as some televisions, draw a higher wattage than their normal operating wattage rating when they first startup (Motor typically requires 2-3 times of the continuous wattage). This is known as peak power, and this information should also be listed on the device’s label. Most inverters also have a peak rating, when buying power inverter, check product specifications first then look at the number of “peak power”. So make sure the inverter’s peak rating is higher than the peak wattage of the device you intend to power. 6. What type of battery should be used with your power inverter? When we buy power inverters for a car, we don’t have the right to choose the battery, because they have been fixed. Every power inverters listed above are perfect for your car, you don’t have to worry about the battery. 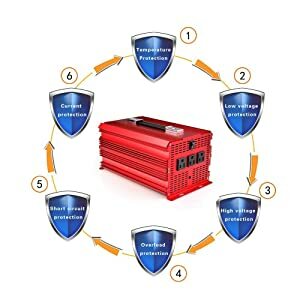 But for 500 watts and larger power inverters, I recommend using 12V deep cycle batteries which will give you several hundred complete charge/discharge cycles. They are designed to be repeatedly drained and recharged. If you use the normal vehicle starting batteries they will wear out after about a dozen charge/discharge cycles. If you do not have a deep cycle battery, I recommend that you run the engine of your vehicle when operating the power inverter. When the inverter will be operating appliances with high continuous load ratings for extended periods, it is not advisable to power the inverter with the same battery used to power your car or truck. If the car or truck battery is utilized for an extended period, it is possible that the battery voltage may be drained to the point where the battery has insufficient reserve power to start the vehicle. In these cases, it’s a good idea to have an extra deep cycle battery for the inverter (installed close to the inverter), cabled to the starting battery. It is recommended to install a battery isolator between the batteries. Buying a power inverter for a car (with a cigarette lighter) maximum power limits below 400 watts is completely sufficient. For some outdoor workers, or need to use high-power electrical appliances, can select the battery direct connected power inverters. Such car inverters can supply 500 watts or even higher power, it can drive some small motors and 1000 watt or higher power devices. You need to consider how many outlets you need or is there any USB port. 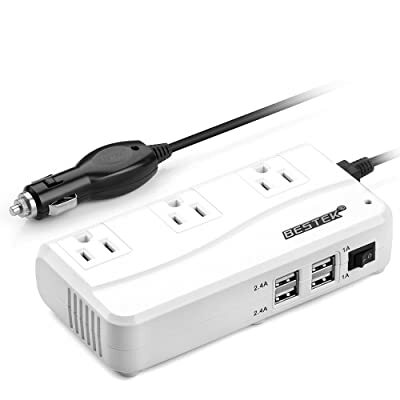 So you can connect multiple devices to the power inverter simultaneously with more than 2 outlets or the USB port is useful for charging phones and mp3 player. Read customer reviews on Amazon.com first about the products you tend to buy. Make sure you choose the right size, type of inverters. If you purchase an inverter that allows higher wattages, proper installation becomes a bit more critical. Below 400 watts, the cigarette lighter connection is still a possibility, but wattages above that require a direct connection to the battery. In fact, if you try to pass more than about 400 watts through a cigarette lighter connection, it will fail — and it might even start a fire in your vehicle. Always use a power inverter that is rated high enough for the device(s) you are running and avoid adapters that would allow more outlets than the unit is designed to accommodate. Working with car batteries can be dangerous and can result in serious injury, and improper use of a power inverter can lead to electrocution or battery failure, so for your own safety be sure to read and follow any and all safety precautions that are listed in your power inverter owner’s manual. When using your power inverter continuously inside a vehicle that is not running, the engine should be started at least once an hour for 10-15 minutes to keep the battery from discharging. Do not start a vehicle in a closed garage, as the carbon monoxide in the exhaust is fatal. Check the owner’s manual for the proper wire size for battery cables when connecting the inverter to the battery. Most manufacturers recommend 4 to 10 feet of cable length, depending on the inverter. Avoid aluminum wire because it has higher resistance to current flow than copper wire. If the power inverter is being used while the vehicle is running as in the case of a road trip, there should be no problem with the extra draw, assuming the battery and alternator are in good condition. Power inverters work best with a battery that is in good condition and fully charged. A weak battery will be drained easily if demands are too high. This could leave you stranded so be sure to check the battery’s condition before using a power inverter in a stationary vehicle.